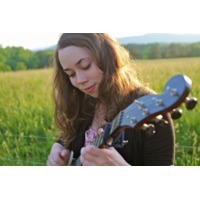 Sarah Jarosz (pronounced /dʒəˈroʊz/ jə-rohz) is a bluegrass multi-instrumentalist, singer and songwriter whose first CD, Song Up in Her Head, was released by Sugar Hill Records on June 16, 2009. She was nominated for a Grammy Award in the category of Best Country Instrumental Performance for the track "Mansinneedof" from that album. Sarah was born in Austin, Texas on May 23, 1991, but was raised in Wimberley, Texas. She picked up the mandolin at age 10 and has been called "a songwriter of uncommon wisdom" by the Austin Chronicle. She also plays clawhammer banjo and guitar and wrote all but two of the thirteen tracks on her album. Jarosz began attending the New England Conservatory of Music in the fall of 2009.